In Astrology the planet Uranus is believed to be connected to a person's inventiveness and the potential of their intelligence. It is also regarded as a planet of change and its appearance in birth charts is thought to highlight someone's independence and individuality. Uranus takes around 84 years to complete its rotation, it's slow orbit makes it dim when viewed in comparison with the other visible planets. Its influence in horoscopes is not weak however as it is concerned with the higher thinking processes and intuitiveness. Uranus helps form a personalities insight and understanding in the particular area it appears in an individual's natal reading. Uranus is the seventh planet in proximity to the Sun and was the first planet to be discovered by telescope around 1781. It is the coldest planet in our Solar System and is mainly made up of Hydrogen and Helium. Uranus has an ice and rock center and a mixed cloudy atmosphere. It has low forming watery clouds and an upper cloud layer of Methane. This celestial body has rings that can circle it's spherical shape in the pattern of an archer's target. It also has a number of Moons that revolve around it in a circular motion. Astrologically the fabulous planet Uranus makes its presence known by adding enlightenment to the possibilities of the human mind. The significance of all planet and star influences is usually connected to the story telling in ancient legends. As planets tend to be named after deities the myths associated with them often accompany their meaning and purpose. In horoscope analysis the mythical indications can help with the interpretation of readings. As Uranus is a quite newly uncovered planet it does not have many stories linked to it. When it was found this new planet was named after the Greek God Ouranos who was regarded as the God of the Sky. Uranus received its title due to its orbital placement and in line with Saturn who was assumed to be the father of Uranus, and Jupiter who is accepted as the father of Saturn. The few myths that exist about Uranus tell of him standing for light and purity and he is portrayed as having an analytical mind. His knowledgeable and thoughtful approach signified him as a great intellectual who was individualistic and insightful. He is believed to have taken Gaea the Earth Mother for his wife so uniting the heaven and the Earth. They had many children who form the basis of many legendary tales about how the skies, land and water were divided up. Uranus may be a recent discovery as a planet but its ruling forces from Greek and Roman Gods gives us clues to its influencial power. Within the horoscope formation it can reveal a lot about how a person works out solutions to things and is especially relevant in answering relationship questions. In terms of Astrology study Uranus acts as a form of observer within our minds that assimilates important information. These more advanced thought processes go towards our overall comprehension of life. This additional understanding from the presence of Uranus can initiate differences in the many other areas of our personality. It's position at the time of birth can sometimes affect a person's level of intellect, reasoning and compassion. Uranus is also able to sway emotional elements of people's personalities. So it may influence reactive behavior and this is why it is useful to consult and refer to where there is an inquiry concerning personal relationships. For astrological useage there are two separate symbols to identify the planet Uranus on any predictive analyzing. The first is a circle of spirit topped by a cross of matter to form an antenna shape. The second is probably more commonly used and this is the seed of potential in a circle with an ascending arrow. This symbol was created from a mix of the Sun and Mars symbols and shows drive over the circle of spirit. It is best to be able to recognize both these icons when studying individual natal charts. The revelations of Uranus are very informative when looked at alongside all the other revealing aspects of a horoscope charting. To remember either symbol you should try to recall the dotted circle with the arrow or the electronic receiver shape. Uranus is ruled by the Western Sun sign of Aquarius the water bearer who is noted for their dreamy, inventive, original and independent streaks. This is the ideal astrological driver of Uranus as this sign's typical characteristics blend perfectly with this planet's influential aim. It signifies and emphasizes the power of observation and how we learn lessons from the challenges that life presents us with. Simply put Uranus denotes observancy and deep meaningful thought to create insight and perception wherever it lines up in a horoscope assessment. 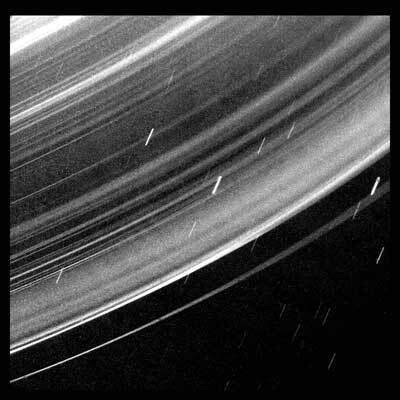 Uranus has a system of narrow, faint rings. Ring particles are dark, and could consist of rocky or carbonaceous material. The greenish color of Uranus' atmosphere is due to methane and high-altitude photochemical smog. Voyager 2 acquired this view of the seventh planet while departing the Uranian system in late January 1986. This image looks at the planet approximately along its rotational pole. 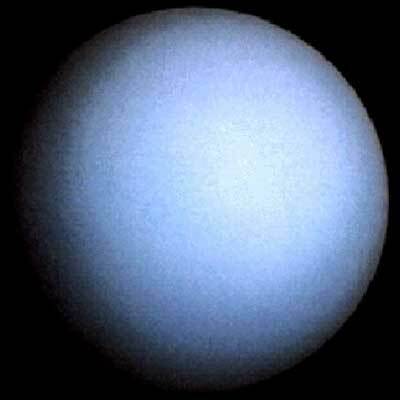 URANUS: Great primeval God of the Sky. Born of GAIA, the Earth, he covered the world in the form of a vast bronze dome and ruled over everything. Taking GAIA to wife, he impregnanted her with many children but was not prepared to deal with the consequences. In fact he was terrified of the monstrous brood of TITANS forming inside her and threatened terrible reprisals should they ever pop out. GAIA, wanting to protect her children, kept them inside herself as long as she could, but pretty soon the pain was unbearable. Relief only came when CRONUS, their youngest son, stepped in. Or rather, popped out. Armed with a sickle, he lopped off URANUS's... er, well, let's not go into details. Suffice to say that URANUS was cut off in his prime and CRONUS took over as supreme being. Your ideals are met, your ideas succeed, your health is fine, and traveling is favored. You can see the way ahead more clearly now, and business transactions favor you. Today's aspects contain sufficient spiritual wherewithal to make it worthwhile for you to participate in religious worship. If you stumble on valuable information now, be sure to use it honorably and for the benefit of all. Travel gets the green light, and you could undertake some weekend trip with good results. You can grasp golden opportunities quickly if you keep in touch with new developments and friends who are in the habit of helping you. Close emotional relationships are accented. You have a good feeling about the present. Keep romantic attentions where they belong if you don't want a big emotional upset in time to come. Take care of health issues that come up today. Organize your day unselfishly and give support to those who need you.